An offering of workshops on subjects for the beginning jewellery student. learn to use a jeweller's saw. learn safe torch handling techniques to anneal and solder metal. 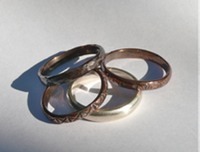 create two sample textured rings in copper, as well as one in sterling silver. develop their skills using a jeweller's saw to create a pierced design in metal. 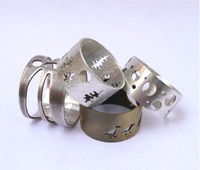 create a sample pierced and soldered ring in brass, as well as one in sterling silver. learn how to use a jeweller's saw to create a pierced design in metal. learn how to anneal metal. learn how to make four different rivets. 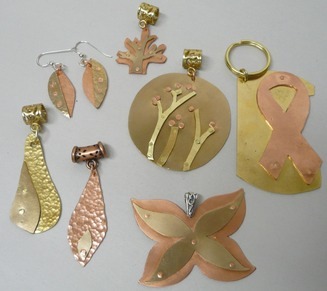 create a pendant, pair of earrings, or keychain using the piercing and riveting techniques learned using copper, brass, and bronze. create a sample textured ring in copper, as well as one in sterling silver. Sept 20 - Oct 4, 2012 Sold Out Contact the ATC to be added to the waitlist. 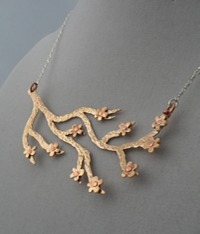 develop their skills in using a jeweller's saw to create a pierced design in metal. learn how to make a variety of rivets. create a pendant, pair of earrings, or keychain using the piercing and riveting techniques learned. create a pendant, pair of earrings, or keychain, using the piercing and riveting techniques learned.